Mandelson’s higher education cuts will speed "marketisation": occupy! strike! Immigration: Tories play "race card"
Anti-fascism in Barking and Dagenham: "we have to offer an alternative"
London Underground: end of the line for 'Public Private Partnership'? British Airways dispute: abolish the anti-union laws! 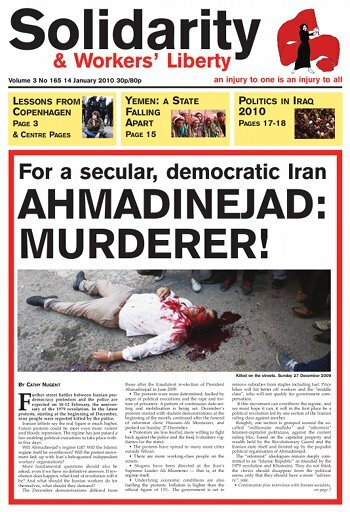 Ahmadinejad: murderer! For a secular democratic Iran! Support the workers! "Workers are the power and strength we need"
RMT decides not to back "son of No2EU"
Iraq: "There is a political system which is a reality... but very crisis-stricken"
On 22 December, Peter Mandelson wrote to the Higher Education funding body outlining nearly £400 million in cuts in higher education for 2010-11. The figure exceeds by £135 million the £180 million cuts and £83 million in “efficiency savings” announced in the 2009 budget. And in last month’s pre-budget report the government announced a total of £600 million in cuts by 2013. On 12 January the Russell Group, the UK’s 20 “leading” universities accused the government of bringing higher education “to its knees”. Under the banner of the obvious (“A Year for Change”) David Cameron has ushered his party, the media and “political classes”, if not the rest of us, into full election mode. The Tories have issued a draft manifesto, scheduled news conferences, the unveiling of posters and new internet campaigns some five months before the expected election date on 6 May. Labour has begun to enter the fray — but unless Brown experiences a Damascene conversion he has little new to say, and none of it positive. The behaviour of Britain’s two biggest revolutionary socialist organisations where they have trade-union positions is coming to resemble more that of the old Communist Party than any of the best elements of the Trotskyist tradition both the SWP and SP claim affinity with. Jane Loftus, President of the Communications Workers Union and the SWP’s [Socialist Workers’ Party’s] most prominent trade unionist, recently resigned from the SWP after she supported the Interim Agreement that brought the big strike movement over jobs and conditions in Royal Mail to a halt. In many ways, the coming general election does not seem an inspiring one for socialists and militants. Faced with the choice between a discredited, right-wing, anti-working class Labour government and a revived Tory party, some will be tempted to sit it out. Things are made worse by the fact that there are few left Labour candidates, and that the main “left” coalition outside Labour (the “son of No2EU” effort) looks very thin and shaky politically. Do not despair, however. There is something positive you can do in this election. In a depressing piece of political jockeying, David Cameron has played a race card, with a sweeping pledge to cut immigration to “tens of thousands” (down from around 200,000 a year). He has said he will cut immigration to the levels of the 1980s. He could get near that only by trying to ensure hardly any migrants at all are allowed into the the UK. After announcing a “March 4 Sharia” in London on October 31 (and then calling off at the last minute), Anjem Choudary’s Islam4UK — a far-right descendant of al-Muhajiroun — recently pulled another bluff by announcing and then cancelling another action, this time in the small Wiltshire town of Wootton Bassett. The march was banned, and that ban was swiftly followed up by a legal proscription on Islam4UK as an organisation. Nottinghamshire Stop the BNP group, together with similar organisations, is planning a conference some time in March to create a network of groups, national materials and resources for the upcoming struggles against the BNP and EDL. We need a working class campaign against racism and fascism. This means campaigning to mobilise the working class, through trade unions and community campaigns, on the basis of their own politics. This means building open, democratic political and organisational structures where they do not exist. Lee Waker, Labour councillor for Dagenham Village Ward and a CWU activist, spoke to Solidarity about fighting the BNP in Barking & Dagenham, where BNP leader Nick Griffin will stand in the General Election. The responsibility for the growth of the BNP in Barking and Dagenham lies with the Labour government and its policies. There is a strong Stoke division of the EDL, based around Stoke City supporters, and unofficial Stoke City internet message boards are full of talk about their mobilisation in the city on 23 January.